1933 Surf-o-plane 2 ft 7 "
Catalogue No. 164 Notes by Mick Mock Insert entry here. An early juvinile model with an unusual three chambers. Image below. September 2004 King Street Newtown. It was invented by a Sydney doctor in 1932, Dr Ernest Smithers of Bronte NSW, who worked for eight years to develop it. Sir Charles Kingsford Smith, his friend was a proprietor of the invention. The design, although hand-made, '' was soon in mass production, being hired by the half hour on Sydney beaches, and proving popular with all ages and both genders. Surf-o-planes were... filmed for Movietone News 6/7 (1935), ...Movietone News 7/15 (1936), ...Movietone News 8/13 (1937), ...Movietone News 9/14 (1938) , which included shots of Dr Smithers riding his invention at Bronte, ...and...Movietone News 10/6 (1939) " . Thoms : Surfmovies page 40. 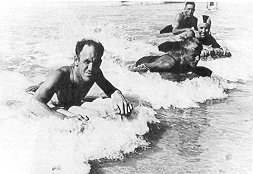 Stan MacDonald, resigned from his position as Chief Beach Inspector at Bondi in September 1933, to take up the Surfoplane and deck-chair franchise at the North groyne on Bondi Beach. Excluding time at the war, Stan was hiring out surfoplanes, etc (and spraying on coconut oil for suntans-1937) for well on 50 years. Examining the events of Black Sunday (the most celebrated rescue in the history of Australian surf life saving), 6th February 1938, Brawley comments on the development of the Surfo-plane. Certainly it post dates Smithers and C. D. Richardson's patent application of 7th October 1932 noted above. 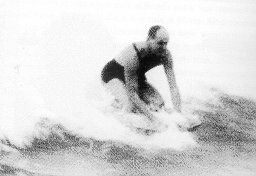 Surf-o-plane riding was included in 1938 Australian Surf Titles (only time, won by Jack 'Strawb' Turnbull) and in the Makaha contest for a period in the 1930's. Surf Life Saving Association of Australia: Surf in Australia. Bob Holcombe has proved himself the consistent individual competitor for Cronulla in this series of carnivals. Bob's fame is derived from his uncanny skill on the surf-o'-plane; in fact, local clubmen consider this race a benefit event for him. Last season, after winning a novice surf race, the major number of surf-o'-plane events, including the Australian championship, he continues his sequence for 1937-38 with nine consecutive wins to date, including the championship again. 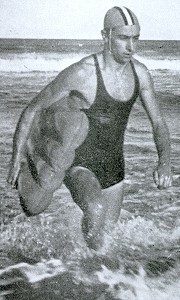 Bob Holcombe (Cronulla) Surf-o-plane Champion of Australia. 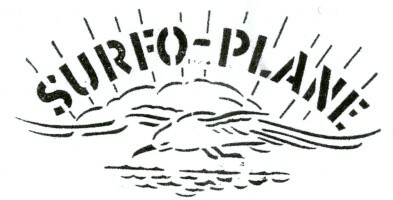 In 1940 the Surfoplane company, concerned about increasing patent infringements, manufactures only black and/or yellow models and favours sales to beach hire concessions. In the 1940's, the Advanx Company acquired the manufacturing rights and marketed the Surf-o-plane using the Advanx brand. Although the company is often associated with Olympic swimmer and industrialist Sir Frank Beaurepaire, he resigned his directorship of Advanx in February 1923 to persue business interests in Melbourne, where he started the Olympic Tyre and Rubber Company in August 1933. - Lomas, Graham: The Will To Win - The Story of Frank Beaurepaire. Heinman, Melbourne, 1960, pages 77 and 103 to 107. There were eventually three models - Elite (5 ft), Standard (4 ft) and Small (3 ft). Colours other than black were also available - yellow and black with yellow stripes. Narn SF2 approximately 3ft (900mm) long, two tone yellow and green. Available with palm tree and beach scene decor. Narn SF3 approximately 3ft 7'' (1100mm) long, two tone yellow and green. The contribution of this design to modern surfing is immense. In Australia it was used extensively by all types of beach-goers and was the basis for juvenile surfers to gain surf experience before advancing to surfboards - for example, four times world champion, Mark Richards Knox : M.R. pages 6 to 8, 14 and 16. 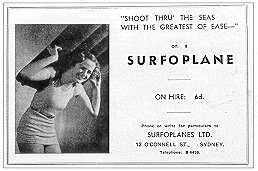 The Surfoplane had similar impact around the world, photographic and text evidence suggests the craft was widely used in New Zealand, Hawaii, California, South Africa and England. In the 1980's the dominant prone board would be the Morey Boogie. Performance: The Surfoplane had high buoyancy, but were relatively heavy and stiff, unlike the craft that replaced them. This combination of features assisted both getting through the surf and wave riding. 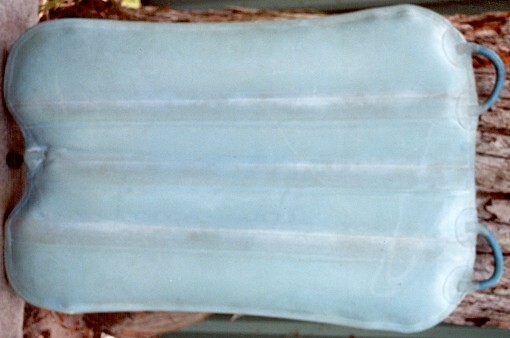 Examples: The nature of the rubber used in the Surfoplane meant that if it was not constantly inflated they would bond internally, and become useless. As a result, it appears few have survived to the present day. One blue/yellow example is held by the Peninsular Surf Centre, Victoria. Thanks to Ted Bainbridge. Margan and Finney photographs pages 137, 138 and 158. Damien Lovelock and Angela Katerns and public contributors, on ABC Regional Radio, 1999. Natalie Williams :Surfo Resurfaces, Daily Telegraph, September 24, 2001. Page 13. 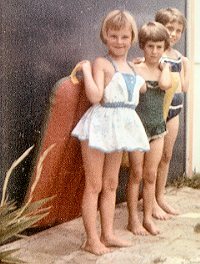 "FOR five decades, the humble surfoplane was a comforting part of the Australian summer - an ingenious but simple device that helped generations of grommets grow confident enough in the waves to become surfers or surf-lifesavers. But, says John Ruffels, a Bondi postman and amateur historian, the dramatic story of the surfoplane's inventor, Ernest Smithers, a Bondi doctor, has been largely forgotten. Next week, Ruffels will give an illustrated talk on the surfoplane and the eccentric physician who devised it. He stumbled on Smithers's story on his postal round when he delivered a letter to Dawn Ping, the widow of Dr Aubrey Ping, one of the early "test pilots" of the surfoplane, an inflatable floatation device made of rubber, which Smithers first demonstrated on Bondi Beach in 1933. What surprised Ruffels was the range of the doctor's ingenuity. "He also invented the true-slice breadknife, the stainless steel steak tenderiser and the Capsulex contraceptive gel," Ruffels says. "They were an odd mix but, like the surfoplane, they were all designed to give people confidence." Ruffels says Smithers began his working life as a court stenographer before deciding to study for the leaving certificate at night school. He studied medicine at the University of Sydney before falling out with the authorities. Despite being married, with two young children, he set off to Scotland to complete his studies before returning to Australia. Short of cash, he took a part-time job at Palm Beach, where he bought, repaired and sold yachts. There he encountered canvas floatation devices that were used to keep the yachts afloat while they were being repaired. "He used the floatation devices to get ashore," Ruffels says. "On another occasion, he had a go on one of those huge surfboards, which had just come into fashion in the 1920s, unwieldy things made of redwood or balsa." By combining the two concepts, Smithers came up with the idea of a much shorter, more manageable inflatable device that could be used easily in the surf. However, it took eight years, and many different prototypes, before he was ready to launch the final, four-tube surfoplane in 1933. His hero, the aviator Sir Charles Kingsford Smith, proved a critical backer when Smithers was trying to persuade councils to allow him to hire out surfoplanes on beaches in Sydney. By February 1934 the first official surfoplane race had been held at Coogee Beach, and soon the device was a popular feature of beach holidays in many countries, including Britain, South Africa and New Zealand. The surfoplane remained popular until the 1970s, and many emerging surfers, including Nat Young, Wayne "Rabbit" Bartholomew and Tom Carroll, learnt their surfing skills on one before progressing to a surfboard. In the 1950s Smithers's design was refined by North Australian Rubber Mills, which introduced a model with handles. Smithers made little money from his inventions, however. "He was a bit of a hippie," Ruffels says. "He would invent all this wonderful stuff then sell the rights for very little." Smithers died in 1976, about the time manufacture of the surfoplane ended, but in 2001 three Newcastle businessmen bought the rights and began manufacturing new, highly coloured versions. However, the day the surfoplane came of age was February 6, 1938 - the infamous Black Sunday, when five people drowned at Bondi Beach and 250 were rescued. Rescuers were handed surfoplanes, who in turn gave them to people who had been washed out to sea. "The fact that they had something to hang on to probably saved a lot of people," Ruffels says, "but half of them shouldn't have been out there in the first place." Using surfoplanes had made them overconfident in the surf. John Ruffels's surfoplane lecture is at Bondi Junction RSL on Monday at 4pm." Both images from Thoms:Surfmovies(2000)page 40. This email was received while the History section ''1934'' incorrectly credited the invention of the Surfoplane to Sir Frank Beaurepaire. At the time this entry (#146) was being processed based on the work of Albie Thoms. scrapbook of original newspaper articles and photographs attesting to this fact and would be happy to scan some and send to you. (also see Websters Encyclopaedia CD Rom Aust Inventors 1997) Another interesting fact is that Sir Charles Kingsford Smith, his friend was a proprietor of the invention. I would be pleased if you would contact me as his family are horrified that after all his hard work it has been attributed to Frank Beurepaire who may well have manufactured them but was NOT the inventor! surfoplaning at Manly Beach, circa 1940. 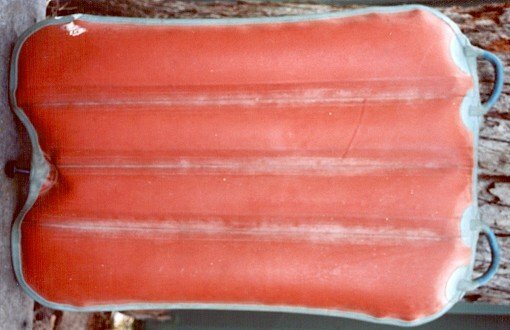 Because I have recently had two enquiries from your readers about Surfoplanes, I thought I'd rouse myself and fine-tune the Herald interview (shown on your excellent site), and try to clear up the mystery of the three barrelled Surfo. Point one: Dr Ernest Smithers got his design from combining the canvas floatation device used to keep boats afloat during repair work, and a long board (of the Redwood design) made entirely of hard rubber!! When Smithers had a ride in the surf on one of those, it snapped in half! This gave him the idea, because he then proceeded to surf on the truncated device - shorter board. (We are talking the mid 1920's). So, from using the inflatable canvas idea from the flotation device, and the short rubber board from the bigger (hard rubber) original, he combined both to create the Surfoplane. It took him eight years and his test pilot mate, (Dr) Aubrey Ping of Bondi, recalled them, both going round the local motor garages at Bondi beach asking for old motor car tyre inner tubes to work on. (Mid 1920's). which is Malayan for "Lightning", but told his wife he played a big part in developing the design of the Surfoplane. His widow said he was a strong surfer and Dr Smithers was not, but Dr Smithers invented several things, and in retirement to Sussex Inlet, used to swim the bay as exercise! So, my doubts creep in there. Although he does look a bit ungainly in the Cinesound clip at Bronte. Now, as regards the three barrelled Surfoplane. World War Two in Manly. I had thought 'The Beacher" had three barrels, but now I'm not so sure. The State Library of New South Wales has an interesteing photo of a three barrelled surfoplane, which looks like an early prototype. Its on their Picture Search site. 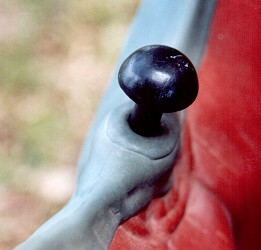 Smithers did take Advanx Rubber to court for making their own surfoplane, but settled, in 1936. Sorry this is so long, but, hey, so is history! SURFER AND A KNEEBOARDER ON IT.